Elvin is the co-author of NET ALERT: Helping Your Child Overcome Internet Addiction Through Building Strong Relationships. holds a Master of Business Adminstration and a Diploma in Electronics Engineering. 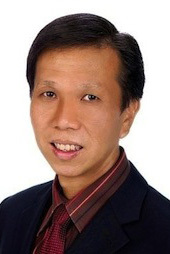 Elvin has over 19 years of sales and marketing experience in the field of electronics. In the course of his work, he had travelled extensively within Asia Pacific and had conducted many courses like “Professional Selling Skills” and “Applied Product Marketing” to hundreds of working professionals. He was a part time Lecturer with Nanyang Polytechnic where he taught Advanced Diploma courses in Strategic Marketing Management. Elvin is also a Family Life Educator with Families For Tomorrow Services. He has conducted several talks to parents on the subject of computer addiction. His passion is to foster and see the restoration of parent – child relationship and for fathers to be more involved in the family. He is also a Senior Training Advisor with Dare to Train, a training institute committed to excellence in training. Elvin is happily married to Mun Yin, a trained counsellor, for 19 years. He is a proud father of two children, Daryl, a teenager in Secondary One and Amelia, a Primary Three student.